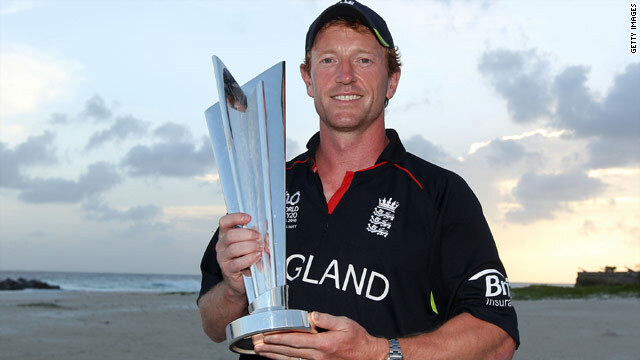 Captain Paul Collingwood proudly shows off the world 20/20 trophy after England's victory over Australia (Getty Images). Is this really a new glorious dawn for English cricket or another false one? The exciting, fun, entertaining thrill-a-minute ride that is 20/20 cricket was first played and devised in England and now a nation not exactly noted for regular sporting triumphs on the world stage can rightly claim to be the best. I was in Barbados for the comfortable seven-wicket victory over Michael Clarke’s Australia and I have to say the English were certainly worthy winners. Superbly led by captain Paul Collingwood and a rejuvenated Kevin Pieterson, they never looked in trouble. The squad combined experience with youth. Stuart Broad for example is an exciting prospect. It’s certainly unfair and way too early in his career to label him the next Ian Botham – I’m sure Stuart himself would be the first to conceed that – but the future’s bright for this nucleus of players. I was interested greatly by the Australian response though to this defeat. Clarke was clearly very disappointed by this loss but you sensed a win for the Aussies would have been more a case of the icing on the cake for them. Ricky Ponting, the Australian Test captain, will have been watching events unfold closely of course and it would have been great for his country had they added the world 20/20 title to complete their sweep of World Cup and Champions Trophy successes. Another Ashes series looms large on the horizon starting in Brisbane in November. The Aussies were already a wounded animal after last year’s defeat in England and you just sense that this 20/20 setback to the English once again will only fire them up a lot more. Remember what happened the last time England tried to successfully retain the Ashes down under? That’s right, they were put to the sword in emphatic fashion by one determined Australian team. The challenges ahead in the coming months will say a lot about the moral fibre of this current England team. But what about the tournament as a whole. I think it’s fair to say that for, the cricketing purists, the 20/20 version of the sport will never be the real deal. Take the comments of Sri Lankan captain Kumar Sangakarra whose team reached the last four before losing to England. In his view, there's simply nothing better than playing for your country. In Test matches. That's his valid opinion and of course he's entitled to it. There are many merits to the five-day verson of the game not least of all its heritage and tradition. But surely nobody can argue cricket is better served long-term by broadening its appeal to the masses and taking it to places a few years ago you'd never even have thought possible. Like the USA for example. In the next few days, the state of Florida will host an international 20/20 gathering, and Sri Lanka for one will be there. And, in my view, that's great to see. For a nation so passionate about Major League Baseball, why not introduce all the fun, passion and flair of this form of cricket? I'm sure many top players were sceptical when the concept of the revolutionary new twist to cricket was first put forward but I also feel now there are many converts. Take Michael Hussey of Australia. He was the Aussies' match-winner in that sensational semi-final victory in St Lucia at the expense of champions Pakistan. His 60 not out from just 24 balls was among the most devastating spells of top-class sport I've ever been anywhere near! The mission statement for 20/20 cricket is centered on entertainment. Players and fans alike have been won over ….now watch it grow and grow! After the birth of t20 cricket the sport has grown globally.Secondly it has started to attract more youngsters to play the game.But still, the number of t20 matches should be reduced so that test cricket could also be played.Test cricket is the real form of the game as it tests the real skills and abilities of a cricketer. New games win new converts. T20 Cricket and Kabaddi are on the fast track. Audiences for the last two World Cups in those two disciplines have enjoyed every bit of the action provided by the hugely talented exponents of cricket and kabaddi.